The 1920s Jazz Age in New York was a decade of rapid cultural and urban transformation. Innovations such as radio, tabloid newspapers, and movies with sound began to command the attention of New Yorkers, and as Times Square became America’s movie mecca, the center of New York’s cultural life shifted from downtown to Midtown. 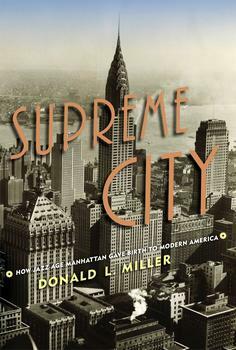 In Supreme City, Donald Miller charts Manhattan’s modernization by delving into the era's brilliantly ambitious personalities and the engineering triumphs, including Grand Central Terminal and the Holland Tunnel, which shifted New York’s commercial, social, and cultural hub to Midtown. Donald Miller is the John Henry MacCracken professor of history at Lafayette College in Pennsylvania. He is the New York Times best-selling author of 7 books including Masters of Air: America’s Bomber Boys Fought the Air War Against Nazi German. One of the country's most respected authorities of WWII and U.S. History, he is a consultant and advisor to historical productions on HBO and PBS.